BiteFX is a license-protected software product. 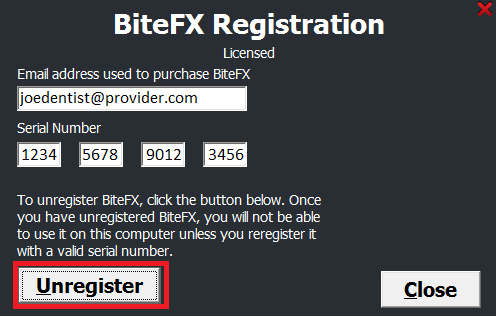 Whenever BiteFX is installed on a computer, to enable continuous use of the software it must be registered using a 16-digit serial number provided after the software order has been placed and the software agreement either physically or electronically signed. 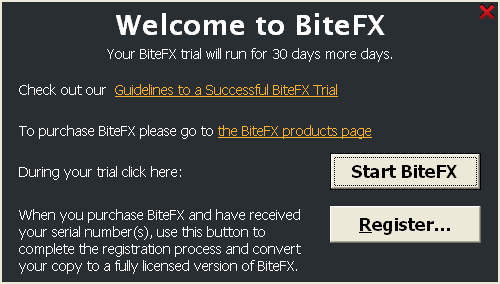 Without registration, it is possible to start and use the BiteFX software for 30 days as a free trial, after which BiteFX will not start without registering it. From the desk of Stu Harman, our support and coaching expert. In this article Stu explains what to do when you see a message that you need to run BiteFX as Administrator to update Registration Information when trying to register your BiteFX software. BiteFX is a license-protected software product. 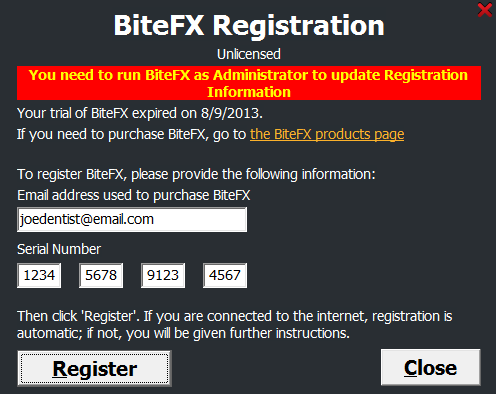 When BiteFX is initially installed on a computer or if the software has been unregistered, to enable continuous use of the software it must be registered using a 16-digit serial number provided at the time BiteFX was ordered, and the customer's current email address as it appears in the BiteFX customer database.